We’d love your help. 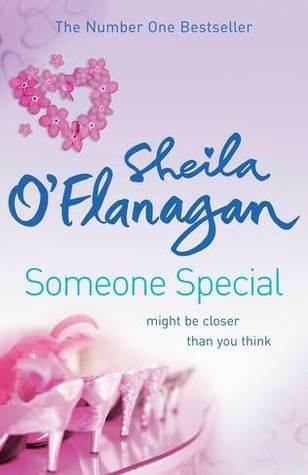 Let us know what’s wrong with this preview of Someone Special by Sheila O'Flanagan. To ask other readers questions about Someone Special, please sign up. I agree with the only other reviewer of this book - normally her books are really enjoyable - gentle, but very readable. THis was a drag with no real direction - I mean, who cares? This is the worst book I have ever read in my life. I'm usually a fast reader, but this was so boring it took me forever to read. The characters were so boring and self-involved. I seriously almost fell asleep while reading this several times. I wouldn't recommend it to anyone. I've always enjoyed Sheila O Flanagan's writing but this is not her best by any means. It's easy to read, the plot is OK and characters well drawn but the story line is weak in comparison to her other books. Usually when I read a book I already have an idea what to write about half way through the story .... but this time I’m a bit stumped. My first book by Irish Sheila O’Flanagan is about Romy, an Irish archaeologist currently living in Australia who is suddenly called home by her step brother, Darragh, because their mother is going to have a back operation and will need some help. She has to leave her best friend Keith behind in Sydney and confuses things by kissing him as she says goodbye to him a Usually when I read a book I already have an idea what to write about half way through the story .... but this time I’m a bit stumped. My first book by Irish Sheila O’Flanagan is about Romy, an Irish archaeologist currently living in Australia who is suddenly called home by her step brother, Darragh, because their mother is going to have a back operation and will need some help. She has to leave her best friend Keith behind in Sydney and confuses things by kissing him as she says goodbye to him at the airport. When I finished the book I felt a sense of “not satisfied”. The story in itself was good, the writing was well done with good character descriptions. But it was the characters that I wasn’t able to relate to, though the story would have been very easy for me to do so. At some point Romy said to her sister “I just lost that chip on my shoulder” and I had to re- and re-read the paragraph, but I still don’t understand what had happened or what had been said for her to “lose the chip on her shoulder”. Also, O’Flanagan has added a lot of backlog, which I believe was necessary so to understand the family members more, but sometimes I felt like flicking through those pages, just to get on with the story. Like all her previous novels, Sheila O' Flanagan's Someone Special also features her heroine tracing her roots back to Ireland, a welcome change from all the London based chick lits. I loved the unique flavor which one experiences in the book. Although the concept of family troubles is not entirely new, the way Flanagan expertly brings it out in this book is one of its many charms. The story starts with passionate archaeologist, Romy Kilkenny being asked or rather ordered by her half brother Darr Like all her previous novels, Sheila O' Flanagan's Someone Special also features her heroine tracing her roots back to Ireland, a welcome change from all the London based chick lits. I loved the unique flavor which one experiences in the book. Although the concept of family troubles is not entirely new, the way Flanagan expertly brings it out in this book is one of its many charms. The story starts with passionate archaeologist, Romy Kilkenny being asked or rather ordered by her half brother Darragh Dolan ,to return back home to care for her glamorous, ill mother, Veronica. Admist hesitation, misgivings and utter confusion due to having kissed her best friend Keith at the airport, Romy returns home. Although, I loved Romy right away, I found Kathryn and Veronica interesting too. Romy can be seen to be a bit self piteous at times but that passes when you get to know the real reason. The end part involving Kathryn's husband Alan reminded me of Danielle Steele's Journey but it certainly kept the plot running and interesting. 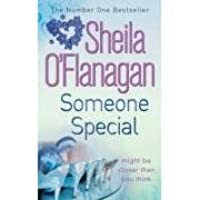 Someone Special is certainly not Sheila O' Flanagan's best considering I had read Bad Behavior before this one but it is definitely recommended. This book explores the tensions and joys of beig part of a family. The main character Romy Kilkenny who is living in Australia, is enjoying live and a career aswell as sharing a house with her best friend Keith. One day she gets a call to say she's needed back in Ireland. Her nice and easy live is about to get turned upside down. Romy's mother Veronica is a very glamerous socialite who has never understood her youngest daughter who has neither interest in fashion nor social graces. To make it wo This book explores the tensions and joys of beig part of a family. The main character Romy Kilkenny who is living in Australia, is enjoying live and a career aswell as sharing a house with her best friend Keith. One day she gets a call to say she's needed back in Ireland. Her nice and easy live is about to get turned upside down. Romy's mother Veronica is a very glamerous socialite who has never understood her youngest daughter who has neither interest in fashion nor social graces. To make it worse, Romy is a half sibling to Darragh and Kathryn,from her mothers first marriage, who always made her feel second best. Coming home was the last thing on her mind. And to make things worse she tried to kiss her best friend Keith goodbye at the airport. Would this be the end of their friendship? this is my first book from her!!! n i reallly loved it!!! it ws diff to read smthn relatd to family emotions n loads of drama. smthn dt happens in my life too.. i ws pessimistic jst like romy abt my future wt my family, wat wt all d arguments n nvr ending differences btwn me n my dad... although im d orginal daughter of d family, like romy i felt outcasted for unknwon reasons..somethn i made up in my mind... i guess dt ha to go... and i realised evry family cn live wt each odr , withholdign each this is my first book from her!!! n i reallly loved it!!! I've always quite enjoyed Sheila O'Flanagan books in the past but this one seemed to go on and on. I wasn't particularly eager to get to the end and find out what happened to the main character because the ending was fairly obvious from the first couple of chapters. It's a large-ish book at 500 pages but not one I'd particularly recommend. I really enjoyed this book, though it was a bit slow. I liked the differences between characters, what they have gone through and how react when they need each other. It was my first book by Sheila and I will definitely read more! Really good read. I didn't think I was going to like it in the beginning as did find it hard to get in too, but then I couldn't get enough of it an found it hard to put down. What I loved about this book was that all the characters were vastly different. Darragh and Gisele were so self-centred that they did begin to annoy me a bit - you're supposed to be family! Kathryn was self-efficient, the 'geeky' one of the family, and Romy, being the youngest, was carefree and loving her life travelling the world. When Romy gets back to Ireland to look after their mother, Veronica, things are testy, to say the least. But as the novel moves forward - albeit rather slowly - the family dynamic becomes for apparent, they each family member begins to realise that things don't have to be as complicated as they've made them out to be. All families are dysfunctional in their own way, but the Dolan-Kilkenny family take it to the extreme. There were some laughs, and heated moments, as well as frightening near the end of the story. It was a great read, just a bit slow. This novel is about a family needing to find themselves. However I did not like a majority of the characters, that is just a preference because she wrote them so well that I had to not like them because of a few things. The writing style of having a perspective for each of the characters instead of just staying with one definitely helped elevate the story. The climax wasn't what I thought it would be at all but it all came together in the end. I found this book a little hard going. I liked the basic premise of the story but it seemed to take way too long to get there and I kept waiting for something to happen. Even when there were big events in the book I still didn't find them particularly engaging. Overall I was disappointed. I loved every page. I felt that I knew Romy so well. I loved her doubts and insecurities yet admired her passion for what she loved. This was a hair’s breadth away from a five star rating. Absolutely AWFUL. Took me forever to finish this tripe. A nice fluffy chic lit that flowed nicely and ended well. O'Flanagan turns her hand to dealing with the complex relationships found in families where step siblings exist. Romy is the protagonist who relishes her job in Australia as an archaeologist. Her step brother Darragh shames her into coming home to look after her socialite mother Veronica who needs back surgery and help in her convalescent period. As Romy has never really got on with her mother this sounds like hell on earth and despite looking for excuses to avoid coming home feels obliged as bot O'Flanagan turns her hand to dealing with the complex relationships found in families where step siblings exist. Romy is the protagonist who relishes her job in Australia as an archaeologist. Her step brother Darragh shames her into coming home to look after her socialite mother Veronica who needs back surgery and help in her convalescent period. As Romy has never really got on with her mother this sounds like hell on earth and despite looking for excuses to avoid coming home feels obliged as both Darragh and his sister Kathryn are unable to help. Kathryn is an account specialising in fraud investigations in the US , married to Alan she has the perfect lifestyle and simply cannot drop everything to come home. Darragh and his wife Giselle live close to Veronica but Giselle is heavily pregnant and cannot take on the responsibility and of course as MD of the family business Darragh is far too busy to help. In their eyes Romy is the only one without a responsible job and therefore must come home. Veronica has tried to be a good mother, married 3 times she is a social butterfly and looking good is important to her, Romy is the complete opposite and sparks fly often as she grew up feeling unloved compared to true blood siblings Darragh and Kathryn. The novel explores the mother / daughter relationship in the convalescent period . Someone special... Sometimes that someone special is truly closer than you think. What I loved about this book was Romy, the youngest, who had the proverbial chips on her shoulders, was still able to get through situations. It is a story of a mother and her 3 children. A family of different natured people brought together by their mother's second marriage. They start rough and end up learning to talk through the difficulties and be civil to each other. It makes me realise that a dysfunctional fam Someone special... Sometimes that someone special is truly closer than you think. What I loved about this book was Romy, the youngest, who had the proverbial chips on her shoulders, was still able to get through situations. It is a story of a mother and her 3 children. A family of different natured people brought together by their mother's second marriage. They start rough and end up learning to talk through the difficulties and be civil to each other. It makes me realise that a dysfunctional family is not that bad. After all, wouldn't it be boring if everyone got along all the time and was always nice to one another. Differences might not always be good or healthy for families, but they sure add spice to life. It makes you see each others flaws and possibly work on getting rid of the negatives. That's what the characters in this story do. I loved how the characters worked with each other and how they made sense of their own life while dealing with their mothers illness in the background. It is truly a matter of listening to your heart, looking at tough times as just that and not taking things too much to heart. It's about giving life and people space, chance to be themselves and make mistakes. Just be there to support them in winning as well as failures. Then Kathryn arrives and spars with Darragh about managing the firm.And Veronica decides to change the rules..
Giselle, Kathryn and Alan.They all are different and react differently.And Romy thinks of the Australian, Keith..
Sheila O'Flanagan is hereby declared as the best chic-lit author i have read. I love how her novels are insightful, while not being depressing or demanding. Someone Special, is a book I totally adored. I especially loved how we are given insight into how each individual think. If it hasn't been that way, I'd have been thinking that Romy is the underdog, and despised all the other characters. But I feel the most for Kathryn now, and feel that sometimes Romy had no idea how good she had it. Even Ve Sheila O'Flanagan is hereby declared as the best chic-lit author i have read. I love how her novels are insightful, while not being depressing or demanding. Someone Special, is a book I totally adored. I especially loved how we are given insight into how each individual think. If it hasn't been that way, I'd have been thinking that Romy is the underdog, and despised all the other characters. But I feel the most for Kathryn now, and feel that sometimes Romy had no idea how good she had it. Even Veronica, is understandable, if not justifiable in her actions. I loved how there were so many twists, but still managed to maintain the semblance of reality. My only problem is the name of the book. The name, as well as the blurb lead to think tat this is a love story, but it is far from a romantic story. ok - u know who romy will end up with from the beginning .... ?! this book wasn't about a silly love story. its about how two best friends can fall in love without realising it. its about how messed up families can be but in the end they can work it out. its about how close someone can be and how no one else can replace this person. someone special might be closer than you think. and that what made the book worth reading even if I give it 3 stars, I'm comparing it to other books I read but that doesn't mean that I didn't like it. I enjoyed this story. I hadn't read a book by Sheila O'Flanagan before. I thought the plot was interesting and very plausible. She touched on so many topics: Step families, sibling rivary, domestic violence....... There was depths in the characters. I will certainly pick up another book by this author! I really enjoy Sheila O'Flanagan books and this was no exception. Romy is called home from Australia by her half siblings to look after their mother following a surgery. They think her life is easier to disrupt. She'd had a difficult childhood relationship with her mum and wasn't looking forward to being cooped up in the family home.